Rachel Goldberg is an award-winning filmmaker who has directed more than 30 productions for stage and screen, garnering over 20 awards for her work. She has been supported by the Sundance/Women in Film Financing Initiative for her feature, TRANSFORMATION AWAITS, based on the short film, NEIGHBORS,starring Kelli Garner (SECRET LIFE OF MARILYN MONROE) and Edi Gathegi (TWILIGHT). 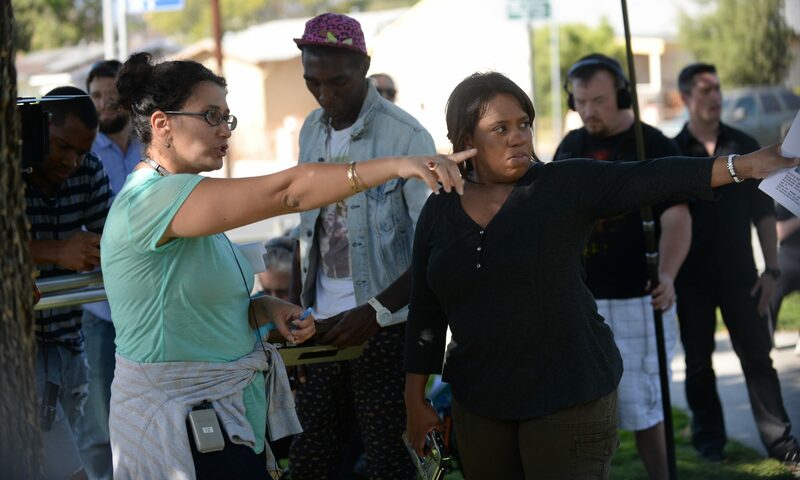 NEIGHBORS was created through AFI’s prestigious Directing Workshop for Women. Recently she was recognized by studio executives who included her on The Alice Initiative List, among directors Ava DuVernay and Katheryn Bigelow. Rachel directed MUTED, a film about media discrepancy when a child of color goes missing, starring Chandra Wilson (GREY’S ANATOMY) and Malcolm-Jamal Warner (THE COSBY SHOW) which sold to HBO. This film was nominated for a Black Reel Award alongside DEAR WHITE PEOPLE and SELMA. She was selected for the Sony Pictures Television Diverse Directors Program, the We for She Direct Her Program, FOX Global Directors Initiative and the Ryan Murphy HALF Foundation. Through these programs which are designed to promote more women directors in television, Rachel was invited to shadow multi-talented Chandra Wilson on the hit show, THE FOSTERS, and was subsequently selected to shadow on the critically-acclaimed shows, HOMELAND under phenomenal director Tucker Gates, and AMERICAN HORROR STORY under the incomparable Jennifer Lynch. Named one of “30 Emerging Filmmakers to Watch” by Film Independent, Rachel was selected for Film Independent’s Project: Involve as a Directing/Writing Fellow where she created ROSITA LOPEZ FOR PRESIDENT and was subsequently chosen to participate in the highly competitive Film Independent Screenwriting Lab, where she further developed TRANSFORMATION AWAITS. As a writer, Rachel has been recognized by the Film Independent Screenwriting Lab, Sundance, the Academy’s Nicholl Fellowship, Cinestory Foundation, Rhode Island International Film Festival and more. Currently, Rachel is attached to direct the feature films TRANSFORMATION AWAITS which is being produced by Triangle Road Entertainment, and WELCOME TO CAMELOT which is being produced by Sundance/Cannes alumnus, Todd Remis (MAGIC MAGIC) and TIFF veteran, Julie Snyder (TANNER HALL), as well as a thriller through Mar Vista Entertainment and CIRCUS CIRCUS based on the stage play by the same name. She serves on the Board of the Unusual Suspects Theater Company and is a Board Member Emeritus for the Alliance of Women Directors. Her work has been described as “poetry in motion” by the LA Weekly and “stunning” by the LA Stage Scene. Rachel earned her MFA in Directing for Film and Theater from the California Institute of the Arts and her BA in Theater and Psychology from the University of Pennsylvania.